Saffron Strands: Christchurch Fish - London needs you! We've all got the message by now that seafood is good for you, but finding quality fresh fish in London isn't easy for the home cook. Some of the best is to be found on London Farmers' Markets. It was fantastic to see Les of Christchurch Fish, who trades at Blackheath and South Kensington markets appear on the Bermondsey Trail, centred around Maltby Street, one Saturday in December. I was wowed by the freshness of the catch, though as the weather conditions in December had been less than ideal for fishing, the produce was limited. Fishing conditions at the moment are excellent for this Dorset co-operative of small inshore fishing boats. 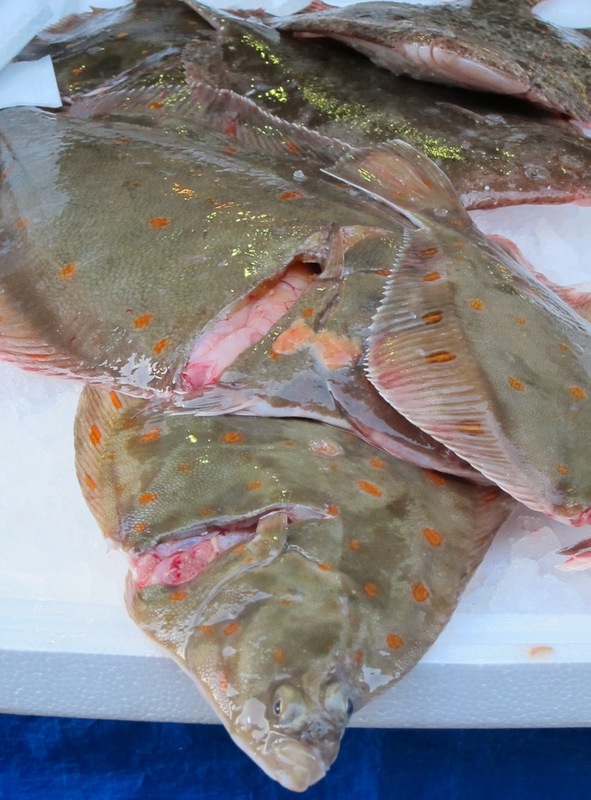 Last Saturday's catch included lobster, crab, seabass, gurnard, place, pollock, pouting, flounder and turbot, along with cockles, mussels and clams. The "beautiful" herrings I was hoping for were sold out by the time I got there, but the brill I spotted was sensationally good. Using ecologically friendly fishing methods, the catch is preserved in soft-ice immediately and the boats return to their home port of Mudeford each night. Selling direct means there's no hanging about in the distribution chain. A lot of the fish on offer elsewhere can be up to five days old by the time it gets to our tables. No wonder we don't eat enough fish. The methods used by Christchurch Fish seem to me to be real sustainable fishing - small boats, fishing a local area, bringing in whatever is caught. Though I did ask for more information when Les mentioned they carry out some dredging for scallops early in the year, prior to beginning hand-diving in May. There is no question that dredging by 'otter', 'beam' and 'pair' trawling, carried out by boats over 10 metres long, is bad for the environment. The issue of dredging is contantly under discussion and I wondered what this small-boat co-operative is doing gathering scallops in this way. The answer was "there's dredging and dredging, much depends on the weight of the dredge, the type of ground worked and the intensity of the dredging. We have one boat that crabs year round and dredges a very small area bounded by his crab pots for two days a week, weather permitting, for about ten weeks a year when the crabbing is poor. That skipper has worked the same ground for 15 years and scallop stocks there have remained healthy throughout that period." Although I'd like to understand this subject more, it seems obvious that the fisherman would be crazy to damage his own patch. Having sampled a range of fish and shellfish, it was no surprise to me to hear this month that Christchurch Fish were voted 2011 "Favourite Stall" by market shoppers at South Kensington. Voters singled them out for their "knowledge, customer feedback, excellent product and reasonable prices". 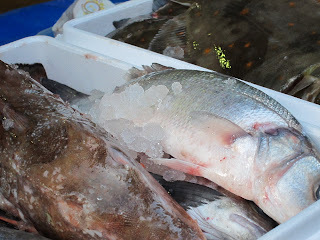 The care taken to catch, handle and transport the fish and shellfish is consistently apparent. Les is more than happy to talk fish and knows his subject inside out. It feels like shopping on the quayside, and it's in the middle of London. To find out what Les will be bringing to market each week, you can go to Christchurch Fish's website and subscribe to his weekly email. You can also give him your order to avoid finding the herring you'd set your heart on is going to end up on someone else's plate.